You may remember a few months ago I was lamenting the state of falafel here in NYC. One of my co-workers suggested Fatoosh, and I’m very glad that she did. They may advertise pizza (or “pitza” as they call it) on their sign, but the falafel is the real reason to go (shown here in a wrap). 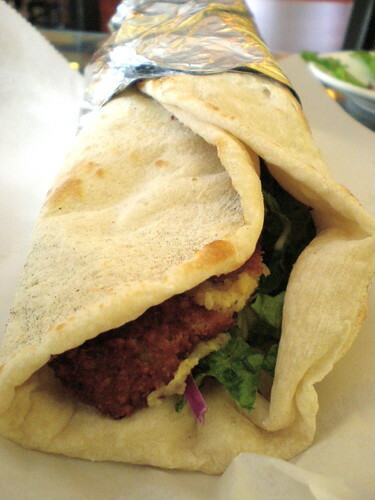 The falafel is wonderfully seasoned and crispy on the outside, just they way it should be. I wish they had a wider variety of “salads” to put on top, but falafel beggars in Park Slope can’t be choosers.